The way your fridge is organized may not seem that important. It’ll just make finding the shredded cheese easier, right? While that is technically true, there are a number of other benefits to organizing your refrigerator. Storing your food properly in your fridge will keep your foods fresher longer, saving you money on your grocery bills. If you avoid over packing your refrigerator and maintaining a steady temperature you can also boost your refrigerator’s efficiency! So what should the inside of your fridge look like? Read on for six tips for a better organized fridge. Before you really get into organizing your fridge, take a moment to clean it out. Toss expired or bad food and wipe up any spills or messes. If you’re goal is an organized fridge, this should always be your first step. to throw them out when they get old! Eggs should go where the temperature is most consistent in your fridge; generally the middle shelf or as close to the middle of the fridge as possible. Keep your eggs in the original cartons, as they’ll last longer. Raw ingredients like meats should go on the lowest shelf in your fridge. It may also be a good idea to put raw meat in a plastic container to catch any accidental drips and avoid contaminating anything in the drawers beneath the lowest shelf. You’ll also want to keep your milk on the bottom shelf in the very back of the fridge where it is coldest. Same thing goes for yogurt, sour cream and cottage cheese. This is the warmest part of your fridge so this is where you should keep condiments, which are usually high in vinegar or acidity and can stand a warmer temperature. A lot of people will keep milk or eggs in the door of their refrigerator but they really shouldn’t go there. They need to be in the coldest spots. Your butter and soft cheese can live in the dairy compartment on the door though, since they don’t need to stay as cold. The drawers at the bottom of your fridge are made to control humidity to keep the contents fresh for long as possible, making it the perfect spot for your fruits and veggies. Vegetables do best in high humidity, and fruits do best in low humidity or the crisper. Your drawers should be marked so you know the difference. Your deli meats belong in the shallow meat drawer (it’s a little bit colder there than other places in the fridge) or the bottom shelf. You can add plastic turntables to the inside of your fridge to help de-clutter. You may consider adding one for your yogurt and cottage cheese. You can also add extra drawers, for example if you don’t have a meat drawer. If your refrigerator just isn’t as cold as it should be, don’t wait to have it checked out. 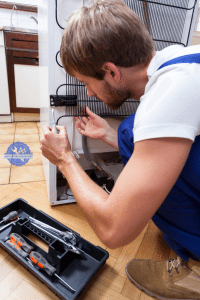 Call the professionals at Complete Appliance Repair! And for some added motivation, right now Complete Appliance Repair is offering 5% off any repair. Schedule an appointment for your refrigerator, or any of your appliances, today! This entry was posted in Blog and tagged clean fridge, Cleaner refrigerator, tips to a clean fridge on May 12, 2016 by admin. Here on the Complete Appliance Repair blog, we want to help you make the most of all of your appliances. Whether that means helping identify a needed repair, or walking you through a simple repair you can do on your own, we’re here to help. We also want to help you maintain and use your appliances in the best possible way. So today we’re sharing 10 awesome dishwasher tips with you! The first of 10 awesome dishwasher tips is to remove as much food as possible before putting your dishes in the dishwasher.. Just take a second when you’ve finished eating to scrape the food into the garbage or down the disposal. This will help you to avoid getting less food caught in your dishwasher filter. Pre-rinsing is a personal decision based on your dishwasher and the type of detergent you use. Some detergents are made to remove residue, and others aren’t. Find what works for you! Generally you plan to rinse oily dishes. It’s also a good idea to pre-rinse if you’re not going to be running your dishwasher very often. Like tip number two, this is going to be a based on your personal preference. There’s no right or wrong answer, just try a detergent and see how it works for your dishes and your dishwasher. Of the ten awesome dishwasher tips we have for you today, this one is probably the most awesome and most under-appreciated. 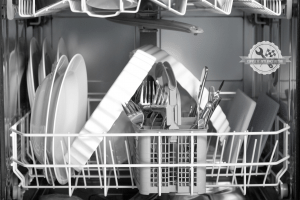 How you load your dishwasher makes a big difference when it comes to cleanliness. Plates should be loaded on the bottom rack with the dirty side facing in. Try to stagger your large and small plates. Pots and pans also go on the bottom facing down. Your cutlery goes in the cutlery holder facing up, except your knives if you’re worried about cutting your hand. Cups, glasses and bowls go on your top rack facing down so they don’t collect water. Plastic containers and large utensils also go on the top rack. Bigger items like baking sheets, platters, or cutting sheets sit on the sides or back of the bottom rack. Never block the detergent or water dispenser, and avoid overloading your dishwasher. A rinse agent helps to dry your dishes and reduce water spots. It also helps to rinse away any excess detergent and food residue. You may use a rinse agent of your choice or you can try using vinegar instead which will work just as well. There are a few things that should never go in your dishwasher and are much better off being hand washed. The first are your good knives. Putting them in the dishwasher can make them dull and rusty. You should also keep your insulated cups, and silver, gold or silver/gold plated items out of the dishwasher. Delicate crystal should always be hand washed. Don’t put disposable plastic containers or aluminum in your dishwasher, and you should never put your cast iron and non-stick cookware in either. Wash your wooden utensils by hand to avoid splitting the wood. Make life easier on yourself and load your dishwasher as you go. Instead of moving your dishes from the table to the counter to the sink to the dishwasher, go straight for the dishwasher! It’ll keep your kitchen less cluttered and make cleaning up a snap. You might think more detergent means cleaner dishes, but that is definitely not the case. Too much soap means buildup on your plates and in your dishwasher. Use the recommended amount of detergent and use the correct cycle. Doing so will save your water and keep your dishwasher efficient. Following all of these 10 awesome dishwasher tips will set you up to form good habits. But you should also specifically develop a good ritual when it comes to running your dishwasher. For example, you can run the dishwasher at night and unload first thing in the morning. Or start it as you leave the house and unload when you get home from work. Whatever you decide, stick with it! Last but not least, run hot water in the sink for a few minutes before starting your dishwasher to get hot water flowing. That way the water in your dishwasher will start out nice and steamy! Hopefully these 10 awesome dishwasher tips make your dish cleaning experience more effective and efficient. If you suspect your dishwasher needs a repair, don’t hesitate to call Complete Appliance Repair today! This entry was posted in Blog and tagged 10 awesome dishwasher tips, Complete Appliance Repair, dishwasher repair on April 19, 2016 by admin. My Dryer Isn’t Drying My Clothes. What Can I Check? If you’ve ever experienced a problem with your dryer not drying your clothes, you know how frustrating it can be. Yes, technically you could hang your clothes up outside or on your shower rod, but we know you are busy. Most days you simply don’t have time to do that! You want your dryer fixed as quickly as possible. 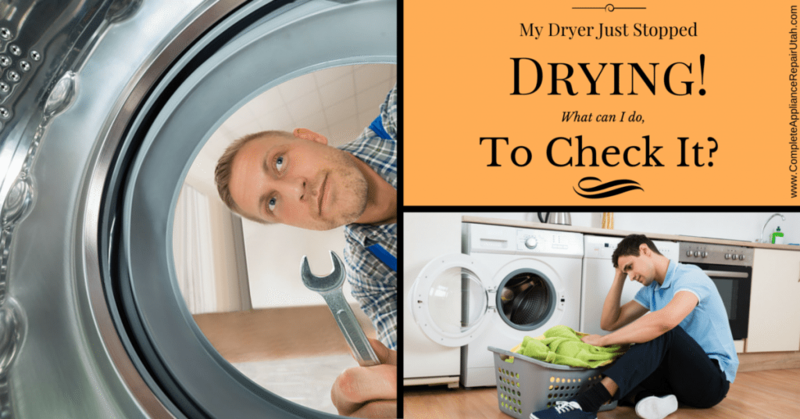 When your appliance that is made to dry things isn’t, there are a few things you can check to determine the problem. Your dryer will not dry clothes if it doesn’t have proper air flow. If a vent is clogged or partially clogged, it will increase your dry time or halt it all together. First, check the outside vent flap or hood. Sometimes birds or small animals can make nests in the vent. Debris can also accumulate. Make sure the flap can open freely and you feel a strong slow of air coming out when the dryer is running. If you can’t feel air or there is a blockage, clean it out. You also need to clean the lint filter. Don’t forget to clean out the lint filter each time before starting your dryer. You can also do a more heavy-duty cleaning by vacuuming out the area under the lint filter with a nozzle attachment. In your yearly maintenance of your dryer, be sure to clean the venting system thoroughly. It will help you avoid drying problems in the future. If your dryer isn’t drying at all and isn’t even turning on, you may have a problem with the power. A power issue may have to do with the outlet power supply, a blown fuse or even a circuit breaker. You can rule these out by checking the terminal block. If it’s not burned out there may be a problem with the door switch, thermostat, start switch or thermal fuse. You may also have an issue with the buttons not fully depressing to make your drying selection. Hopefully this is your problem, because it’s simple to fix. The same goes with a dryer door that may seem closed, but really is slightly open preventing your dryer from starting. You should also check out the dryer’s duct, the metal hose found behind your dryer. Look for any visible damage like kinks or sagging. You should also check the inside for any blockages. Once it is removed, you can shake it out or run a bunched up cloth through it to remove any buildup. If this part is damaged, it needs to be replaced. These are a few simple trouble shooting steps you can take to decide why your dryer is not drying your clothes. With many other possibilities as to why your dryer is on the fritz, call a professional to help you find the problem. 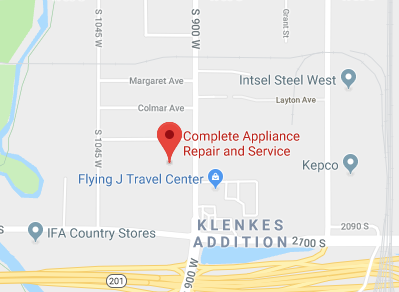 If you’re looking for same day service with a one year parts and labor warranty, give the guys at Complete Appliance Repair. They are experienced with years of electrical and technical repairs, and can work with both older and newer makes and models. Ditch the clothesline and give them a call today! This entry was posted in Blog and tagged appliance repair, broken dryer, Dryer not drying clothes, dryer repair, salt lake city on April 5, 2016 by admin. My washer won’t stop shaking! What can I do? Is it Time For a Washer Repair? As you go about your day-to-day household chores, we all know it’s just a matter of time before a wrench is thrown in your well-intended plans. Sometimes it’s unavoidable. And while there are big and small “wrenches,” maybe you’ve experienced this one – a shaking washing machine. Furious shaking coming from the laundry room is anything but pleasant. If your washer is shaking all the time, it’s not something you need to live with! There are a few reasons this may be happening. Some of them you can easily fix on your own, so keep reading! But after that, it’s best that you call a trusted repair man and get schedule a washer repair appointment right away. One reason your washing machine may be shaking is because the machine isn’t level on the floor. If this is the case, it’s something you can easily fix yourself! First, tip your machine to figure out which side needs to be propped up. Adjust the leveling screw on the base as needed, so your washing machine has good contact with the floor. And if your leveling screws are old or damaged so that you are unable to level your machine, try using a shim (which can be made out of many materials) to level your machine by sliding it under a corner until the machine is level. Another culprit for a shaking washing machine could be an unbalanced load of laundry in your machine. Having all of your dirty clothes pile up on one side of the drum can make your machine lopsided, and this quickly leads to a shaking. If you find there are more clothes on one side of the drum than another, simply move the clothes around until it looks more even and restart the cycle. If your machine is still shaking after trouble shooting for off-balance clothing and feet, you may be in need of a washer repair. Vibrating and shaking mean there are a few different parts that could need attention; you could have a problem with a suspension spring, tub spring, snubber ring or damper pad to name a few! For example, if the shock absorbers (used to absorb movement during the spin cycle) are weak or damaged, unbalanced loads will shake and move the machine while making loud banging sounds. Leaving this piece for long can mean wreaking havoc on other parts of your machine. Or if you have a top-loading washer, the smoothness of your spin cycle may rely on tub dampening straps that help to control and cushion movement. There are four straps that are made of rubber and they attach from the top of the tub to each corner of the cabinet. Overtime, when a strap is damaged, stretched out or broken, the machine will shake as the tub inside makes contact with the cabinet during the spin cycle. These are just two examples of how parts wear out over time and require a washer repair. 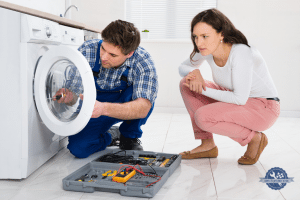 If you’ve tried to level your washing machine on the ground, and tried to balance your wet clothes to no avail, call Complete Appliance Repair. This locally owned and family operated repair shop in Salt Lake City will have your washer up and running, jiggle-free, in no time! This entry was posted in Blog and tagged appliance repair, Washer Repair, Washer Troubleshooting on March 24, 2016 by admin.